With Election Day 2016 rapidly approaching, as in it can’t get here soon enough, everyone wants in on the action. Even dating apps. In partnership with Rock the Vote, Tinder created The Swipe The Vote poll to delve into not just who their members intend to vote for this upcoming Election Day, but who they're actually more suited to vote for based on where they stand on specific issues. Because if you haven’t figured out who you want to vote for, it’s still not too late. The Swipe the Vote poll gave Tinder users in 16 countries the opportunity to swipe either left or right — as they would on a potential love interest — on the major political issues at hand. Depending on which way the users swiped, they were shown the candidate that was their perfect match. From there, if the users wanted to, they could share their matches on social media, as well as get important information about the closest polling stations in the area thanks to Rock the Vote. "We selected these issues because they are some of the most talked-about topics in this election and the most important to our Millennial audience," Rosette Pambakian, Vice President, Global Communications & Branding, tells Bustle. "Helping our users understand these topics will help them choose the political candidate most aligned with their views." What did the poll find? That, among other things, this election isn’t just about the United States anymore. The outcome is going to affect the world and, because of that, the whole world is watching. So get out there on November 8 and vote! But, in the meantime, this is what Tinder and Rock the Vote found. 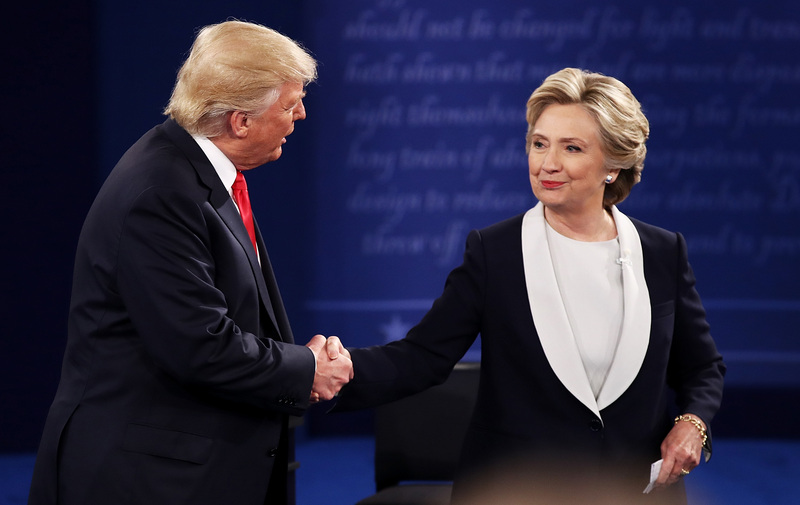 Although it’s not by a “yuge” margin, 57 percent of those who swiped in the United States were matched with Hillary Clinton, compared to only 43 percent who were matched with Donald Trump. As for which candidate users said they plan to vote for, Clinton won that poll too: 53 percent to 47 percent. A third of those polled don’t think global warming is a “legitimate threat.” These must be the same people who think climate change was invented by China, as Trump once proudly announced. Think Trump's idea for a wall is ridiculous? So do Tinder users. Most people don’t want to see undocumented immigrants forced to leave the country… perhaps because they realize we’re all the offspring of immigrants? In fact, 57 percent would like to see a path to citizenship for undocumented citizens. If there’s anything to be learned from this election season, at least when it comes to taxes, it’s that some people can avoid paying them. Which, of course, isn’t fair. According to Tinder’s findings, 65 percent of their users in the U.S. want to see taxes increased for the one percent. Maybe after that’s taken care of those certain people who haven’t paid taxes will be forced to pay back taxes. Wouldn’t that be a novel idea! If other first world countries are willing to pay for college tuition for those who want to go to school, why can’t the grand old US of A get on that, too? It's nice to know that with 56 percent of users thinking that tuition should be free, I'm not alone in this thinking at all. Because Tinder did poll 16 countries total, they were able to gather how the rest of the world feels about this election. According to their survey, 80 percent of people, across the globe, were matched with Clinton, based on where they stood with the issues. As for how they would vote if they could, 73 percent of those polled would vote for Clinton. If women in India could decide, Clinton would already be president. In India, 96 percent of women voters were matched with her, because hell yeah! The only place where Clinton wasn’t getting much love was in Russia. While 76 percent of Russian users were actually matched with Clinton (meaning their views align with her politics), 71 percent said, if given the opportunity, they would vote for Trump. Yes, I’m confused by these percentages, too.